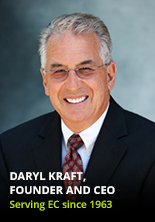 Daryl D. Kraft, President and Founding Owner of Environment Control Building Maintenance Company, is a native Californian and 1965 graduate of Biola University. In 1963 he purchased a small janitorial business while still in college and subsequently incorporated it in 1970. During the next four decades, Environment Control has expanded into 55 companies in 19 states. In addition to his ongoing responsibilities at the EC Corporate Office in Coeur d’Alene, Idaho, Daryl accepts occasional speaking engagements, presenting topics such as: Right Thinking; Criticism Is My Friend; What Is a Christian Businessman? ; and If Taking My Wife Bear Hunting Isn’t Love—What Is? He is the author of three inspirational books: The Businessman’s Guide to Real Success, Knowing the God Who Chose You, and A Different Place. Whether in his writings, his nationally-distributed weekly Bible study CDs, or his day-to-day dealings with others, Daryl seeks to share one simple, liberating message: the Christian life—is the glorious peace and freedom-filled reality of experiencing Christ Himself― growing and manifesting His life—in us. He and his wife Sherryl make their home in Hayden, Idaho, and have four grown children and 14 grandchildren.